RECEIVE A FREE HOME ENERGY AUDIT IN MESA - SAVE 25-99% ON ELECTRICITY! If you are searching the phrase “Energy Audit Mesa” or “Home Energy Audit Mesa” while looking for energy auditors near you to evaluate your home to see how you can save more money on electricity, Alternative Energy, LLC can help in multiple ways! We provide FREE HOME ENERGY AUDITS IN MESA! 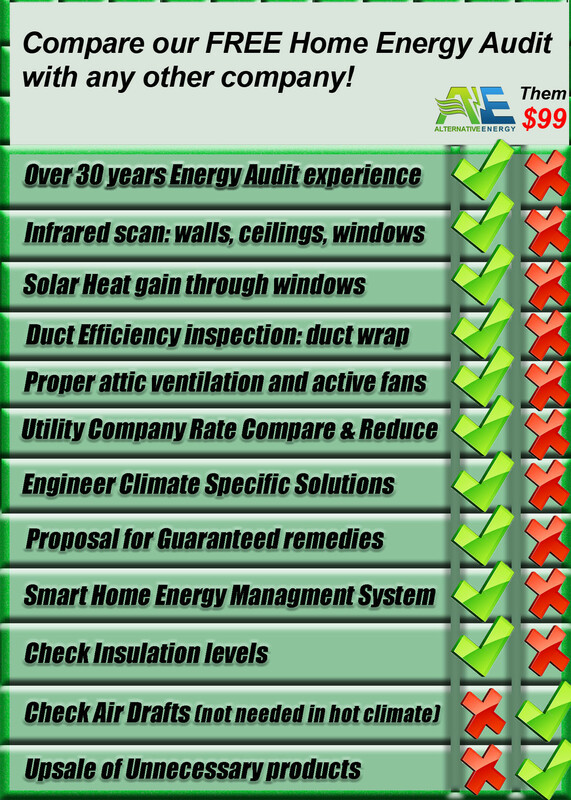 ($500 value) Our energy audits help you find and fix your energy problems and save money on electricity! Using the home energy audit findings will help us design an energy package that will help you save a ton of money on electricity by using a combination of the following energy products and others: Radiant barrier, duct sealing, mini split systems, tubular skylights, solar panels, spray foam insulation or attic insulation. Alternative Energy, LLC provides a variety of energy saving products for Mesa residents. Live in the Mesa Area and want to learn how to save money? Click here to find out how you can save up to 99% on residential electricity or schedule your free home energy audit in Mesa by giving us a call today at (480) 744-1803. Helping Mesa homeowners owners find energy savings solutions that work!